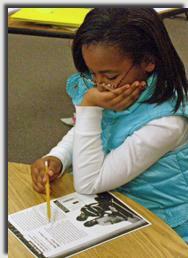 Text copy is available to each child, usually nonfiction. The first couple times, students read sentence-by-sentence coding every sentence silently. We start by using codes I provide. Then, groups or partners share how they coded the selection. Eventually students code naturally in their heads and mark places to discuss with sticky notes. They don’t code every sentence, just the important ideas. It's fun when students make up their own codes or invent additional codes, too. I teach coding as part of our study of connections. I can slow my reading pace. I can code (or annotate) what I’m thinking as I read. I can prepare for discussion by coding (annotating). If your goal is to slow readers down to consider what they're reading, coding is an excellent strategy. In the beginning, I select nonfiction texts to code. I like copies of texts students can write on. I like short selections in order to teach a lesson in one day. Many schools buy Time for Kids or Weekly Reader. The students can write on these materials without any work on my part. An added benefit is that my students, especially my boys, enjoy reading about real events. First, I model how I code. I encourage students to consider EACH sentence and their response to it. We talk though the logistics. What codes do I use? Stephanie Harvey recommends using W = wonder about, I = very important, * = know that, L = learned something new, and C = connection in her book Nonfiction Matters, but are there others? Where do I write the code? Students experiment with writing in the margins or at the end of each sentence or in cartoonlike balloons. They decide what works best for them. Can I use more than one code for one sentence? Of course! Can I code a book I can’t write in? Rip sticky notes into smaller bits and write codes on them. Leaving sticky notes in place is an added bonus. The stickies are a visual of thinking over time like footprints left in the sand. Students can assess their metacognitive progress by looking back at the sticky notes and evaluate their growth. 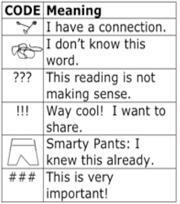 Your students may want to create their own codes. Teacher Terri Griffith's class worked with the codes in the box, right. If you are in a school where everyone teaches the proficient reader strategies, it’s probably best to keep the codes the same, grade to grade, class to class. But, it is fun to create your own codes, especially if the suggestions grow out of the discussion in your classroom. You will want to show students how to code their standardized-test passages. Students are required to read nonfiction accounting for 60% of the selections on standardized tests. Our state allows our students to write in test booklets so coding can be very helpful as a test-taking skill. Coding sentence by sentence is tedious. I don't make my students do that more than a few times and just when they’re learning. However, the initial experience helps them think about one idea at a time. Like adults, young readers mark only sentences they need to once they are comfortable with the strategy. Rely on feedback from your students to determine what they need. Coding can interfere with the comprehension of some readers, especially readers with disabilities. Be on the alert for high frustration levels and as always, be aware of students' modifications. Some readers like coding. They rely on coding texts as a way to prepare for discussion or write about ideas discovered while reading. Many find coding useful when taking tests. Some find it easier to mark a text than write in a journal. Some children code what they want to talk about while they read. Other children go back and mark important discussion points after reading. The point of coding is to read a sentence or portion of text and think about it, read another and think, read and think. It’s one technique that causes readers to pause, think, make connections, discuss and comprehend. When frustration sets in, teachers need to identify what it is the students are getting and help them settle into a bit of successful work, while planning the next best step... Realizing that struggling readers and writers may require multiple demonstrations and multiple opportunities for guided practice before they can apply a strategy or skill by themselves can reduce frustration on both sides. – Ganske, Monroe, Strickland, The Reading Teacher, October, 2003.